8:44 AM Thank you! My Great Grandmother was Maude Stewart daughter of Adelaide Seymour and Jeremiah Stewart. I saw the different spellings. In my family history I was told that Adelaide and Adaline were twins. Do you think that George Stewart married the twin?? Thanks this is helpful. When did the Tampico Tornado start into publication. I can imagine my great great great Grandfather Wm Stewart living along the Rock River, no doubt with Indians! 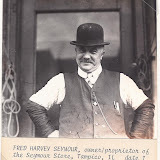 That information is from the family history submitted by Evelyn Seymour Henry, g/d of Fred Seymour. Click on the link to see the family chart. If you live out of the area, you can order them on microfilm via inter-library loan from the Abraham Lincoln Library in Springfield. A separate website for the Gazette newspapers is: Early Sterling Gazette Newspapers which is the actual article online. It is not complete, but well worth checking out. All of these links can be found via our Table of Contents page of our website as well. If you find an article of interest in the Gazette Index, you can contact the Sterling Library and they will mail you a copy of the article for a small fee. 7:42 PM If it would be of help here..... One of my Great Grandparents was Samuel Washington Teach. Sam had a younger brother named John Andrew Teach, b. 16 July 1870 in Washington Co. MD. On 25 May 1891, John married (Whiteside # 8195) Emma May Stewart, b. 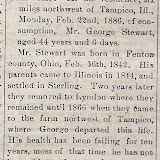 May 1872, the daughter of Jeremiah & Adelaide Leonora (Seymore) Stewart. I was hoping you were reading this and would jump in. I thought I saw something connecting to a Teach family & remembered you connected to them. Thanks for the input - always appreciate your help. 7:34 AM I was just reviewing the Stewart family and notice that Emily disappears after the 1850 census. She would have been of marrying age by1860, but I don't see her listed on the IL State Archives Marriage Database. It's possible that she married in IA or somewhere else,but doesn't seem like a high probability. I wonder if she died? 10:55 AM I've started a STEWART and a SEYMOUR Family Album in our Picasa Albums. Click to open album & enlarge or read detail. Click to open album, enlarge, read details. 1:02 PM I have a Jane Stewart in my Lyon family tree. Jane was born about 1837 in Ohio. Jane and Baxter had at least 2 children: William and Myrtle. The reason I think this may be the right family is because Jane's mother was Amy (no surname) born in Virginia, as was her husband (no given name) born in Virginia, and that seems to fit with the 1850 & 1860 census you have posted here. 10:32 PM Hi Sandi, I believe we do indeed have the same Jane Stewart, I have her as being born July 13 1836(probably Fayette County Ohio) She is listed in the Whiteside County Census and listed as living with Jeremiah Stewart in the 1870 census. Jeremiah was her brother. She did marry Abram Ritter and later married Baxter Lyon in January 1871 and moved to Heston Kansas. Her parents were William Stewart and Amy Atcher (Wright) I did not have any information on any children...so Thank You. Love the ability to learn new information!! Was William Stewarts wife's maiden name Atcher or Wright? Was she married previously? 9:59 AM Sandi she was born Amy Atcher daughter of Cornelius and Mary. She married Josiah Wright in 1823 and no children were known born to the Union. William had a first wife (unable to find out who this was) he had four children with Amy. He had previous children with his first wife, I assume that she must have died as all the children moved with their father from Ohio to Illinois. Hope this helps you.